Because of space restrictions and exposure to constant moisture and humidity, it is important to choose bathroom doors that look natural and blend with the rest of your home, and that are durable and moisture-resistant. Generally speaking, floorspace in your bathroom—and all parts of the home, for that matter—is a precious commodity. Therefore, you should carefully consider how to conserve bathroom floorspace when it comes to choosing styles for your bathroom doors. Common swinging styles for bathroom doors include basic flush and classic paneled models. Additionally, double french doors provide more lavish entrances, and these can work especially well separating the master bedroom from the master bathroom. Be sure that your swinging door will not block necessary bathroom utilities like a toilet, cabinet, or sink when it is open. Sliding doors are generally more expensive than their swinging counterparts due to their more complicated door designs and installations. However, sliding doors such as pocket doors offer the luxury of extra space in small areas like a bathroom. Barn doors slide along the wall, rather than into a pocket in the wall; while these sliding doors will require a bit of extra wall space, they still take up less space than swinging doors. Additionally, barn doors are a unique choice to separate master bedrooms from master bathrooms. Both swinging and sliding doors are available as flush or panel doors. Panel doors are a the most common style of interior doors, and they tend to blend in nicely in most areas of your home. Despite wood doors' classic style, their elegance is usually better saved for other parts of the home. That way, the door's wooden elegance is noticed more and spared from potential warping and rot from a bathroom's dampness and temperature fluctuations. 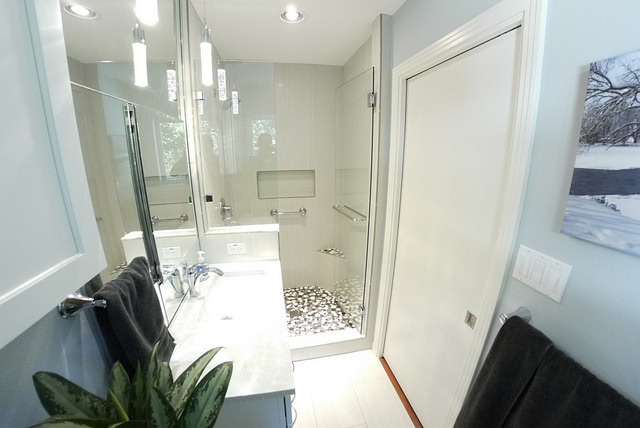 For bathroom doors made from steel or other metals to create a more modernized effect, there is less reason to worry about exposure to a bathroom's moisture due to the improved durability of metals. However, homeowners should still keep in mind that humidity over a prolonged period of time will eventually cause many steel doors to rust. For the most part, modern bathroom doors today are primarily made using fiberglass, as they are far more enduring than other door materials and are also more flexible in terms of design options. Many fiberglass doors can be finished to effectively recreate classic woods like mahogany or walnut, in addition to having a smooth surface rather than an uneven wood grain, making the door easy to paint. Many contemporary bathrooms, especially master bathrooms, feature a toilet that is separated by a door from the sink, shower, and bathtub. For this space, try a door with a frosted glass panel. This style will maintain privacy but give your bathroom a sleek, modern look. Additional bathroom door options, especially for homeowners who seek a more unique look, include concealed bathroom doors and bathrooms doors with stained glass inserts. Try finding a bathroom door made from a durable material that will stand up well to high levels of moisture, such as fiberglass. Panel doors will look natural and simple as a bathroom door, and for a slightly fancier touch, try barn doors or french doors to separate your master bedroom from your master bathroom.